Maura Harrington of Shell to Sea has been in Mountjoy prison for the last weeks, serving a 30 day sentence for supposadely assaulting a Gardai, WSM members have been taking part in solidarity protests outside the prison. Here we reproduce extracts from the blog of one WSM member who has attended some of these protest.Last evening (12 March) after the news of the 30 day sentence imposed on 55 year old Shell to Sea protester Maura Harrington filtered through supporters converged on the gates of Mountjoy prison. By the time the van carrying Maura came into view over 30 supporters were waiting at the prison gates, matched by a similar number of Gardai. There had already been brief scuffles earlier in the evening when a Gardai van drove up to the gates and was blocked in case this was a ruse to sneak Maura in. This time it was known Maura was in the van and most of those present blocked the road. Gardai waded into the crowd shoving people out of the way until they had managed to force the van through the protesters and into the prison beyond. Reports on indymedia.ie from yesterdays court case point out that on the day this 68 year old, 7 stone women was supposed to have assulted Gardai half her age and twice her size "20 people were injured to varying degrees. I know of one lady who still complains of an injury to her leg which she received on that day and I know of another five who had to seek medical attention subsequently. Three days after the incident Shell apologised for the distress caused to the landowner but defended their overall handling of the situation. Similarly Supt. Gannon defended his action and said “Our only role was the right of access, and people sought to confront us. We pushed them out of the way." And also that after yesterdays case "Rossport Solidarity Camp member Niall Harnett is in Castlebar Hospital after being kept in overnight, after being allegedly assaulted in Belmullet courtroom by a number of Gardaí including a Garda that he was due to prosecute in Achill court tomorrow morning, for a previous assault. 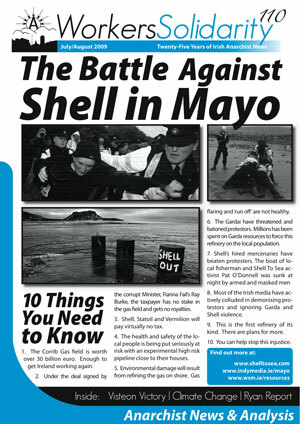 Mr Harnett’s injury occurred when he attempted to act as a witness to a Shell to Sea supporter who was being questioned by a Garda at the back of the courtroom. However Mr Harnett was unceremoniously bundled from the courtroom by 2 to 3 Gardaí and came out the other side of the double doors with injuries. It remains to be seen how serious these injuries are. The last I heard he was getting further x-rays on his back and neck." It should also be noted that taking a leaf out of the old USSR book of medicalising political dissent "Judge Devins also directed Ms Harrington to undergo psychiatric assessment"
On Saturday after taking part in a distribution of the latest issue of Workers Solidarity in the Liberties I headed to the GPO for a rally demanding the release of Shell to Sea campaigner d. Around 50 people had gathered at the GPO in Dublin to demand the release of Shell to Sea campaigner Maura Harrington. After a short period at the GPO we went up to Mountjoy prison where Maura has been held since Wednesday evening. At Mountjoy was notable that a very high percentage of passing car and pedestrians expressed support for the demand that Maura be released. Every taxi that passed beeped in solidarity. The vendictive decision to jail Maura comes at a very significant time when mass opposition to growing to the attacks on Irish workers coming out of the crisis in capitalism. At the same time as the government is proclaiming that there is no choice but to slash our wages, conditions and access to services they continue to give away for free hundreds of billions of euro worth of hydrocarbon deposits at Corrib and elsewhere off the west coast. Friday 27th saw me attend the evening music session at the gates of Mountjoy prison where Maura Harrington is still being held within. Around 60 supporters from Dublin and Mayo gathered at the gates to play music, tell stories and even do a little dancing on a freezing March evening. For the video I took short clips I'd shot on Friday and at a Saturday protest two weeks earlier and inserted the audio recording of Finbarr seeing a song of his own composition about the arrival of the Solitaire pipe lying ship last summer and the mysterious circumstances in which it became damaged and had to withdraw. All sorts of rumors are going around about the Solitaries return, everything from those who say its about to arrive to those who say its unavailable until next year.